Did you know... the winningest coach in National Football League (NFL) history; the youngest tennis player ever to be named #1; 3 Superbowl-winning quarterbacks; a World-Series pitcher; the "Greatest Racehorse of all Time"; Nadia Comeneci's, Kerri Strug's, Dominique Moceanu's and Mary Lou Retton's gymnastics coaches; the Chess Master who beat Bobby Fischer; a 9-time Grand Slam tennis champion; the volleyball "Player of the Century"; the "Greatest Soccer Player in History"; figure skating's "King of the Ice"; the first soccer-style kicker in American pro football; The "Greatest Backstroke Swimmer of all Time"; a heavyweight contender who fought Muhammad Ali; and "The Greatest Table Tennis Player that ever Lived," are all of Hungarian background? But, wait... there's so much more! Click to [Submit] a Famous Hungarian. Please include a Web resource for verification purposes. To maintain the high standards and integrity of this site, submissions cannot be accepted without a verifiable resource. COPYRIGHT: Please ask for permission and CITE this source before using this information. George Halas graduated from the University of Illinois in 1918, where he starred in both football and baseball. He played for the New York Yankees in 1919, but retired because of an injury. He moved back to Illinois, where in 1920, working as recreational director for the Staley Starch Works, he formed the Decatur Staleys. Halas' Staleys went 13-1 that year with him playing end and coaching the team. That same year, Halas participated in a meeting in Canton, Ohio that gave birth to the American Football Association. A year later, the AFA became the National Football League. Halas took ownership of the Staleys in 1921 and was given $5,000 to move the team to Chicago where they became the legendary Bears. The Bear's of the early 40's used this offense to become a power house, winning back to back championships in 1940 and '41. The Bears beat the Washington Redskins in the 1940 Championship Game 73-0, the largest victory in league history to this day. Papa Bear Halas was elected as a charter member of the Pro Football Hall of Fame in Canton, Ohio! Perfect season Super Bowl Runningback, Super Bowl VIII MVP for the Miami Dolphins and Hall of Famer. Pronounced Chonka with "o" as in "own." The classic line-smashing fullback provided the major rushing thrust in Miami's vaunted ball-control offense when the Dolphins were dominating the National Football League in the early 1970s. A consensus All-America at Syracuse and the Dolphins' number-one draft pick in 1968, Csonka contributed almost picture-perfect performances during Miami's three Super Bowl seasons in 1971,1972, and 1973. Csonka surpasses 1,000 yards in rushing all three seasons with his best production, 1,117 yards, coming during Miami's perfect season in 1972. All-AFC three straight seasons (1971-73) and all-pro in 1971, Csonka was selected to play in five consecutive Pro Bowls from 1970-74, although injuries forced him to miss two of those games. Perhaps his best single-game effort came in Super Bowl VIII against Minnesota, when he was selected as the most valuable player. Miami's powerful attack was at its best with Csonka carrying 33 times for a then-Super Bowl-record 145 yards and 2 touchdowns. Extremely sure handed, he fumbled only 21 of his 1,997 career ball-handling opportunities. Csonka's career rushing total of more than 8,000 yards places him among the Top 20 leading runners in NFL history. His importance to the game of football was exemplified when he was elected to the Professional Football Hall of Fame in 1987. His inclusion in that prestigious group came in only his second year of eligibility. Larry continues to work in the "public eye" as host and producer of two outdoor adventure programs. He currently hosts and produces "Stihl's North to Alaska" and "NAPA's Csonka Outdoors," which air on OLN (Outdoor Life Network). A long road was needed to accomplish what Shula did in his career. Don Shula began his football career in fifth grade. He went on to star at Harvey High School and John Carroll University. Don was drafted by the Cleveland Browns in 1951. He was traded to the Baltimore Colts in 1953 and ended his playing career with the Washington Redskins in 1959. Shula became an assistant coach with the Detroit Lions in 1960. In 1963, he was named head coach of the Colts -- at 33, the youngest coach in the NFL. In 1970, Shula became head coach of the Miami Dolphins, Together, the team and the man would go on to make football history. On July 26, 1997, Don Shula capped an illustrious career when he was inducted into the Pro Football Hall of Fame in Canton, Ohio, following his election into that shrine on January 25, 1997, his first year of eligibility. Shula's unanimous election to the Hall was the ultimate honor in a career full of record-setting accomplishments. He now makes GREAT steaks at Shula's! His son, Dave, was also a player with the Colt's and became Head Coach of the Cincinatti Bengals. He was born on May 31, 1943 in Beaver Falls, Pa., a steel-mill town located 28 miles northwest of Pittsburgh. He was a star athlete in high school only in his senior year. Six teams wanted to sign him to a baseball contract, but he decided on football and college. He won a scholarship to the University of Alabama to play for legendary coach Paul "Bear" Bryant, who called Namath "The greatest athlete I ever coached." In his senior year, Namath led the Crimson Tide to the 1964 National Championship! Joe Willie -- as his friends called him -- grew up in an area of Beaver Falls known as the Lower End, a predominantly African-American neighborhood. (Namath would get into arguments with some Alabama teammates when he would defend African-Americans). The 6-foot-2, 200-pound Namath also is the only quarterback to pass for 4,000 yards in a 14-game season, one of the three times he led the NFL in passing yardage. Namath appeared in five all-star games and was twice named Most Valuable Player. He received the prized Hickock Belt for Professional Athlete of the Year, the George Halas Award for Most Courageous Athlete and the Dodge Man of the Year Award. The Jets' signing of the Alabama quarterback for a reported $427,000, an unheard-of figure in those days, and a Lincoln Continental, provided the upstart American Football League with the atmosphere of big bucks, Broadway glamour and the headlines that had been the sole property of the National Football League. His signing triggered a recruiting war with the older league. With salaries becoming inflated for highly rated collegiate players, the NFL, fearful of the cost of competition, eventually offered the AFL a carrot, and the two leagues merged. Following his retirement from professional football in 1977, Namath appeared in movies, in plays and on television. In addition, he served as an analyst for NBC Sports and ABC's Monday Night Football. Tennis Superstar - She has won 9 Grand Slam singles titles and bronze in Sydney 2000! Seles won the European junior championship at the age of ten. She moved to the United States in 1986, and in 1989 turned professional. In 1990 she won her first French Open, and in each of the following two years she won the Australian, United States, and French opens. Seles won the Australian Open in early 1993, but later that year, while resting between sets during a tournament in Hamburg, Germany, she was stabbed by a spectator. The incident caused Seles to withdraw from competition in 1993 and 1994. Seles returned to competition in 1995 and won the initial tournament of her comeback, the Canadian Open. In 1996 she again won the Australian Open. Monica is a fierce competitor and is still going strong into the new millennium including winning the Bronze medal at the 2000 Sydney Olympics! The one and only Tarzan and FIVE-time Gold Olympic swimming legend! "The greatest swimmer of all time"
Johnny was born Janos Weiszmueller in Szabadfalu (Freetown or in German, Freidorf), near Temesvar [now Timisoara after Rumanian annexation] in the Banat region of Hungary where many "Schwabians" / "Donauschwaben" / "Danube Swabians" or ethnic Germans had settled after the pullout of the Ottoman Turks in the 17th century. His parents were Peter Weiszmueller, a day worker from Varjas, and Erzsebet Kersch, of Szabadfalu (the name for Freidorf at the time). His Godparents were Janos Borstner and Katharina Erbesz. The Weissmuller family arrived in New York on the S.S. Rotterdam on Jan 26, 1905 when Johnny was three. Johnny often claimed he was born in Windber, PA because of Olympic eligibility issues. Weissmuller was the winner of the 100m freestyle in 1924 and 1928 and a member of the winning 4x200m relay team in both years. He also won a bronze medal in the 1924 water polo competition at the Olympics. He broke three records at the 1924 Olympics in Paris. Weissmuller set 28 world records and such was his margin of superiority over his contemporaries that many authorities still rate him ahead of Mark Spitz as the greatest swimmer of all time. Because of the limited number of events available to Weissmuller, his Olympic record cannot be fairly compared with that of Spitz but the longevity of his records is a testament to his greatness. His 1927 world record for the 100 yard freestyle was unbeaten for 17 years, a remarkable length of time during a period of rapid development in the sport. From 1921-29 he won every free style race he entered. In addition to his Olympic Triumph, he won 18 Gold Medals at the USA National Championships (1921 - 1923,1925 -1928). Much of his success was due to his revolutionary high-riding stroke, flutter kick and head-turning breathing. After modeling BVD's and successfully playing a fig-leafed Adonis, MGM took notice and invited for a screen test for the role of Tarzan. Weissmuller was chosen over 150 other applicants and went on to become the most famous screen Tarzan of all, playing the role in 12 movies between 1932 and 1948. After 1942 MGM had used up its options; it dropped Tarzan and Weissmuller who then moved to RKO and made six more Tarzans. After that he made sixteen programmed Jungle Jim (1948) movies for Columbia, finally retiring from movies to private businesses in Fort Lauderdale FL. Weissmuller died in Acapulco, Mexico after a series of strokes. Had three children with Beryl: Johnny Scott Weissmuller, Jr.; Heidi Elizabeth Weissmuller; and Wendy Anne Weissmuller. Weissmuller had a close call in Cuba during the time of the Cuban Revolution. While playing golf, he and his friends found themselves suddenly surrounded by a group of Castro's soldiers intent on kidnapping them or worse. Thinking fast, Weissmuller immediately gave his trademark Tarzan yell. The soldiers immediately recognized it and were so delighted to meet Tarzan that they escorted the group back to a safe area. When Weissmuller was introduced to the first Cheetah in his Tarzan films in 1931 (he worked with 8 chimpanzees altogether), the chimp's trainer told him to show no fear or the animal would attack him. As Weissmuller, dressed in his Tarzan loincloth and hunting knife, walked up to the animal, it bared its teeth, growled at him and lunged as if to attack him. Weissmuller took the knife out of the sheath and held it in front of the chimp's nose, to make sure he saw and smelled it. He then slammed the animal on the side of the head with the knife handle. He put the knife back in its sheath and held out his hand to the chimp. It glared at him, bared his teeth again, then changed its mind, grinned at Weissmuller and jumped up and hugged him. Weissmuller never had any further problems with the chimp--although other cast and crew members did--and it followed him around like a puppy dog during all the pictures they worked together. Coaching for the National Team of Rumania in the 1970's, he brought the Rumanian women's gymnastics team to a position of international greatness and would repeat this feat in the US. A hammer thrower and boxer growing up in Transylvania, Karolyi turned to gymnastics coaching in college and exploded to prominence with 14-year-old Comaneci, who startled the world with the first perfect 10 ever scored in Olympic gymnastics. Comaneci, who began with Karolyi at his gymnastics school at age six, scored five more 10s on beam and uneven bars at the 1976 Montreal Games and the Karolyi legend was launched. At the end of a 25-day, 20-city exhibition tour of the United States with Comaneci and his team, Karolyi, his wife and fellow-coach Martha, and choreographer Geza Pozsar lost themselves on the streets of New York City and defected to flee the political repression of Rumania in 1981. Moving to the United States and beginning again was only one more challenge to Béla. In a few years, the American program began to reflect his dynamic approach to coaching, and the names of Béla's U.S. protégés -- including Mary Lou Retton, Kerri Strug and Dominique Moceanu, Kristie Phillips, Phoebe Mills, Kim Zmeskal, Betty Okino, Kerri Strug, Hilary Grivich, and Jennie Thompson -- are now legend. At the 1984 Olympics, Mary Lou Retton became the first American female to win a gold medal in gymnastics. With his retirement, his wife, Márta Károlyi, took the reign as head coach of the U.S. team in Atlanta. Bela came out of retirement at the urging of Zmeskal. He has a ranch now in Texas's Sam Houston National Forest where he runs gymnastics camps and indulges his love for animals by keeping 50 head of cattle, horses, dogs, a camel, deer, a llama, donkeys, mules, goats, pigeons, chickens turkeys, roosters and raccoons. He also maintains THREE gymnasiums. Károlyi employs more than 60 coaches each summer to school more than 2,000 young people who enroll in one-week sessions and train six hours a day. "For bringing great gymnasts to the national and international arena, not only from one country but from two different lands, Béla Károlyi earned induction into the International Gymnastics Hall of Fame in 1997, exemplifying the category of Lifetime Achievement." Tennis Superstar! At 17, she became the youngest #1 ranked player ever and is the youngest to ever win and defend a Grand Slam Title. At 17, Martina became the youngest #1 in the world. The speed of her rise to fame and tennis dominance is blinding. At 12, she became the youngest player ever to win a Junior Grand Slam title at the French Open. She turned professional at only 14 ranked 399 in the world. One year later, at 15, she reached the US Open semifinals, became ranked 13, and later defeated none other than Monica Seles making Martina the youngest player ever to win over million dollars. In 1997, she became the youngest player ever to win a Grand Slam title which she would later defend. She was WTA tour champion, and winner of 5 Grand Slam tournaments. She has won the Australian Open two times, the French Open, Wimbledon, the US Open, and has broken numerous records. Martina Hingis was born on September 30, 1980 in Kassa, part of Northern Hungary from 896 - 1920, (now called Kosice by Slovakia). She began playing tennis at the age of 3, played her first tournaments at 5, and got her name after the legendary Martina Navratilova. It was her father, Hungarian Karoly Hingis, who gave her the first tennis raquet. He was then himself number 19 of the tennis rankings in Czechoslovakia. She was also trained by her Czech mother Melanie Molitor who was also a former tennis champion. At the age of 7, Martina moved to Switzerland after the divorce of her parents. The Federation-Cup of 1997 took place in her hometown of Kassa (Kosice). She represented the US winning all her matches. This was a bittersweet homecoming as she was reunited with her father, Károly. She left Kassa ranked #1. "The greatest racehorse of all time must be, without a doubt, a Hungarian filly by the name of Kincsem." Kincsem was bred in the Gestut Tapioszentmarton, owned by Herr Ernst v. Blaskovitch, and foaled in Hungary. Her name stems from the root word "Kincs" which is Hungarian for "treasure" or "jewel," and the entire word means "My Treasure." Over the course of four full seasons from 1876 to 1879, from ages 2 - 5, she faced the best that all of Europe had to offer, and emerged victorious in all 54 of her races. Legendary Place Kicker: Cleveland Browns Hall of Famer, 6-time all Pro! Known as "The Toe," the indestructible kicker and Hall of Famer of the Cleveland Browns and 6-time All-Pro played in 13 championship games for Cleveland from 1946-67. Groza was the regular offensive tackle from 1947-59. Groza suffered a back injury, which forced him to miss the 1960 season. Groza was a kicking specialist from 1961-67. He was an All-NFL tackle six times and NFL Player of the Year in 1954. Groza owns the Browns team record for most seasons played and the most career points. He also has the record for 107 consecutive games in which he scored a point. He has the most career extra points (640) and the most field goals (233) in team history. Groza's No. 76 uniform was retired by the Browns. Groza was the last of the "original" Browns to retire. The Brown's training camp is located in his hometown on "Lou Groza Blvd." Born to Hungarian immigrants, a decidedly athletic family, he was the smallest (at 6' 3") of three brothers. Lou received his degree from Ohio State in 1949 and became a professional insurance counselor and left tackle/place kicker for the Cleveland Browns. He received the 'gold shoe' for kicking the winning field goal in 1950 championship game. He was installed in the National Football League Hall of Fame in 1974. The Lou Groza Award given to outstanding NCAA collegiate athletes is named for him. He married Jackie in 1950 and made their home in Berea, where they lived for over 40 years, raising their family, a daughter and three sons. Admired and active in his hometown, he lived by a personal creed that goes "always support a good cause in any way you can." Boxer - IBA Lightweight World Champion! The "Ragin'" Rakoczy. Number 1 ranked overall! Jessica had a tough childhood. With Dad out of the picture, She grew up with her Mother and a brother whom she looked up to. Four years older than she was, her brother introduced her to many sports, and, yes, they would fight, with brother usually winning. Jessica excelled at all sports. As a high school athlete she competed in hockey, baseball, football, soccer, track and swimming. She was twice voted her school's athlete of the year. She began working at 13, and, with trouble at home, moved out at 15 and struggled at school. A year later, she lost her Mother to cancer. She was introduced to boxing at the age of 17. Here too she excelled. Her gracefulness and incredible balance in the ring undoubtedly comes from her ballet studies as a child. Shortly after starting her training, she fought competitively for the first time in the Ontario Championships and won the gold medal. She went pro two years later and her brother has lived in fear ever since! Her beauty and grace landed her in Vogue with fellow legend-to-be Laila Ali (see picture on right). Jessica has devastating speed and an incredible double left jab (see fight video highlights in the links below). She is the 1 ranked boxer in the world in her weight class. On February 19, 2004, at the Palace Indian Gaming Center in Lemoore, Jessica won the IBA Lightweight title with a clear (99-90,100-89,100-89) unanimous 10-round decision over Lisa Lewis. - See her Official Site with a highlight video of this Hungarian Powerhouse! World Series Pitcher (Cleveland Indians), 3-time All Star, & Olympics Gold Medal Winner! Charlie played baseball, basketball and football in Roger Ludlowe High School in Fairfield, CT. He then attended the University of Connecticut. He was 2-time All-Big East Pitcher of the Year while at UConn and 2-time All-New England selection and posted a two-year collegiate record of 10-7 w/5 saves and a 2.59 ERA in 29 games, 19 starts. Charles was a member of the U.S. team that won the gold medal at the '88 Summer Olympics in Seoul, South Korea where he led Team USA with a 1.05 ERA. Charles was named to the all-time USA Baseball National Team in a poll conducted by the fans in December of 1999. Superbowl winning Quarterback. Played for the Browns, Cowboys and the Dolphins! Perhaps no player in Browns history is more loved than Bernie Kosar. A native of northeast Ohio, Bernie publicly announced his desire to play for "his" team, the Cleveland Browns. Kosar signed with the Browns on July 2, 1985, becoming the youngest QB in team history. At Boardman High School he was the state Player of the Year in his senior year, passing for 2,222 yards and 19 touchdowns and was also one of Boardman's top baseball and basketball players. His college career at the University of Miami was highlighted by the Hurricane's 1983 National Championship where he was chosen MVP of the Orange Bowl Classic. In 1985 he was chosen by the Cleveland Browns, and made an immediate impact by starting ten games in 1985. He led the Browns to the playoffs in each of his first five NFL seasons, winning four division titles which is the most among all-time AFC quarterbacks since 1970. Bernie is one of only two quarterbacks in the NFL since the 1970 merger to lead teams to three division titles in their first three years in the NFL. In 1986 he led the NFL with a 1.9% interception ratio, establishing his hallmark for accuracy as a passer, and holds the NFL record set from 1990-91 for the most consecutive passes without an interception at 308, breaking the record held for 26 years by Bart Starr. Bernie ranks third in NFL history for all-time lowest career interception percentages with 2.59% on only 87 interceptions out of 3,365 attempts. He also holds the NFL Playoff Record for 489 yards passing against the New York Jets in 1986. In 1987 he was named NFL MVP in voting for the Gillette "People's Choice Award." Mid-way through the 1993 season, Bernie signed with the Dallas Cowboys and substituted for the injured Troy Aikman in the second-half of the 1993 NFC Championship game, leading to the Dallas Cowboys Super Bowl XXVII Championship. "King of the Ice" - 3-time World Champion, 7-time Canadian National Champion, and 2-time Olympic Silver Medalist! Elvis' parents are Steve, from Slovenia, and Irene, a dancer from Hungary. Irene fled communism in 1956 at the age of 19. He has two older siblings, Atilla and Elizabeth. From Time Magazine: "[Elvis] may be the toughest skater ever to enter the rink. Elvis' fortitude is bred in the bones. His mother was the last of eight children in a Hungarian family, his father the first of nine in a Yugoslav household. They fled communist tanks in the 1950s, landed in Canada, met each other in Toronto and married." "In a sport without a long tradition of martial-arts stylists, Elvis' very originality was a problem. The cabal of skating judges, clacking endlessly about athletes' clothes, musical tastes, hairstyles and breast sizes, looked at this karate kid with the shag and the metal-studded costumes--famously designed and stitched by his mom--and they saw fresh meat. "I was ridiculed," Stojko says. "The judges said they didn't like martial arts. I was told to get in touch with my feminine side. I said, 'Buddy, I don't have a feminine side. I'm not a female.'" All-Pro Football Players - Longest Field Goal and all-time leading scorer in New York Giants history! The first soccer-style kicker in pro football! The Gogolaks defected to Austria in 1956 during the bloody Hungarian freedom revolution. 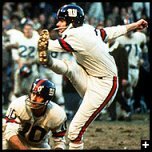 The first soccer-style kicker in pro football, Peter Gogolak not only revolutionized his position but also his sport. In Gogolak's first game, an exhibition in Tampa against the New York Jets, he made a 57-yard field goal, the longest to date in pro football history. He left the Bills after the 1965 season when the NFL's New York Giants offered him a lofty $35,000 contract. In 1966, he became the first established player to jump from the AFL to the NFL and helped start the free-agent war that led to the merger of the rival leagues four years later. He is also the all-time leading scorer in New York Giants history! He has been flying for 29 years and has been a professional pilot, flight instructor, test pilot and aerobat for 20. He has been member of the Hungarian National Aerobatic Team for 18 years and was 20 years old when he took part in his first competition, at the 1982-Austrian National Championship. He won the first place, finishing first in all events. In his autobiography Theismann, Joe states that his father, Austrian Joseph John Theismann married his mother, Hungarian Olga Tobias in 1942 and tells of his consuming childhood ambition to be a quarterback, his success at Notre Dame, his years in Canadian football, his frustrating early years with the Redskins when he was principally a punt returner and, finally, his triumphs in leading his team to two Super Bowls. Joe took his lucky #7 Notre Dame jersey with him to Washington. In 1982, Joe led the Redskins to 27-17 victory over Miami in Super Bowl XVII (I'll never forgive him!). He went to the Pro Bowl and was voted to the UPI All-NFC Team. The following year, he led the Redskins to 14-2 regular season record, followed by a 51-7 rout of the L.A. Rams in the NFC playoffs. The Redskins lost to the L.A. Raiders, 38-9, in Super Bowl XVIII. Theismann was named the AP's NFL MVP, the AP Offensive Player of the Year, the Pro Bowl Player of the Game and to the All-NFL Team. A gruesome broken leg resulting from a sack in a Monday night game against the New York Giants ended Theismann's career in 1985. - Joe also co-authored, "The Complete Idiot's Guide to Football"
Special Thanks to Martin Collinson and his fellow Hogs at www.hogs.net for verifying this submission! England's Premiership Goalkeeper of the Year for 2004 - first American to win the coveted AF Cup title with Champion Manchester United. US National Team keeper. Tim, the son of a black father and Hungarian white mother who came over after the 1956 revolution, grew up poor in New Jersey. He began showing his talents at an early age. Tim said, "I played soccer with the middle-class kids. New Jersey is like that. I didn’t pick goalkeeping, it picked me. But I loved the position and the ups and downs of it.” After playing in the New Jersey league for the NJ Imperials, Tim joined the New York/New Jersey MetroStars in 1998, and spent five and a half seasons at the Major League Soccer club, making 88 appearances for the team. While playing for the MetroStars he was voted Goalkeeper of the Year twice. A member of the US team in Sydney Olympics in 2000, Tim was called up to the US national team in 2002, making his senior international debut against Ecuador in July. He has a total of 9 international caps. After viewing tapes of him in action, England's Manchester United manager Sir Alex Ferguson was so impressed that he sent goalkeeping coach Paul Barron to Houston to watch the recent United States-Mexico friendly. Barron was also hugely impressed after Howard kept a clean sheet and made five stunning saves - and persuaded Sir Fergie to pursue the player. However, Tim Howard did not meet new European Union (EU) work requirements to obtain his permit as he did not have enough international matches under his belt for the US. So, since his mother is Hungarian, Tim was able to apply for his Hungarian passport. Hungary joined the EU in May 2004. Manchester United announced on July 15th, 2004, that it reached agreement with Major League Soccer for the transfer of the registration of Tim Howard for a fee of £2.3m, including associated costs. Tim signed a four-year contract with the English powerhouse. Tim's play during the English Premier League's FA cup final's helped Manchester United win the FA Cup for a record 11th time, defeating Millwall 3-1. United captain Roy Keane became the first player of modern times to play in six finals, the second highest on record, while keeper Tim Howard became the first American to win the Cup. Kiraly learned the game from father (Dr. Laszlo Kiraly) in Santa Barbara, Calif. Kiraly was a volleyball star at UCLA, led UCLA to three NCAA championships (1979, 81, 82), and graduated with a bachelor's degree in bio-chemistry in 1983. He is the only volleyball player in Olympic history to win three Gold medals, having been part of the United States’ Gold Medal indoor teams in 1984 and 1988, and winning the Gold Medal in beach volleyball at the 1996 Atlanta Olympic Games with Kent Steffes. Kiraly leads all pro beach volleyball players in career prize money. Kiraly and Steffes, who teamed for the second-most pro beach titles (76 to 113 for Sinjin Smith/Randy Stoklos), are the winningest pro beach team in history in terms of earnings ($2,880,112). The Gold Medal of the inaugural FIVB Olympic Event Beach Volleyball in the 1996 Atlanta Olympic Games with Ken Steffes. This magnificent boxer won three consecutive Olympic gold medals (1948, 1952 and 1956, beating Jose Torres in '56) eventually amassing an undefeated professional record of 27-0-2 and an incredible amateur record of 288-12. Though professional boxing was outlawed in Hungary, Papp nevertheless turned pro in 1957 and set up camp in Vienna. Although 31 years old, Papp quickly made his mark felt on the middleweight division. Despite brittle bones in his hands, the southpaw Papp carried great power in his left hook. He scored two wins over Peter Mueller in 1961 and following a win over veteran Ralph "Tiger" Jones, Papp KO'd Chris Christensen to win the European middleweight title on May 16, 1962. He successfully defended the title six times over the next three years and scored a non-title win over American Randy Sandy, who was a solid pro and former national amateur champion. In 1965 Papp was on the verge of a world middleweight title shot when the communist Hungarian government revoked his permit to travel abroad, thus ending his pro career and denying him a chance at the world title. Papp later served as the coach of the Hungarian national boxing team from 1971-92. He and Teofilio Stevenson are the only men to win three Olympic boxing titles. But Papp did it consecutively and in two different weight classes. Stars in movie entitled "Heavy Gloves"
"The greatest athlete ever to have been born in Connecticut"
U.S. Open champion 1952, 1963; National PGA champion 1968; National Senior PGA champion 1971, 1977; U.S. Ryder Cup team 1959, 1963, 1965, 1967; National PGA Player of the Year 1952, 1963; winner of 15 PGA Tour events; leading money winner PGA Tour 1952, 1963; PGA Hall of Fame 1974; World Golf Hall of Fame 1982; Connecticut Golf Hall of Fame 1961, World Golf Hall of Fame. Legend of Professional Wrestling, "Wrestling's True Icon"
From Lou Thesz.com: "...He was the last wrestler to legitimately claim the undisputed World heavyweight championship. He held the World title, which pre-dated the NWA title, a total of six times. His first win came at the age of 21 in 1937 over Everett Marshall in St. Louis. He still holds the record for being the youngest world champion of all-time. His sixth title reign ended in 1967, 32 years later, at the hands of Gene Kiniski. His eight-year reign from 1948 to 1956 ranks as the longest world title reign of all-time. He was World heavyweight champion in four different decades and is the only wrestler to ever compete in seven different decades. Thesz was as fierce of a champion for wrestling's credibility and integrity outside the ring as he was in it." He enjoyed a 14-year career with the St. Louis Cardinals, the Kansas City Royals and the Atlanta Braves. In 1975 the ball finally listened to his yells and other antics, and he turned in a career-best record of 13-3, with 22 saves to capture the National League Fireman of the Year Award. He is now an analyst for FOX Sports Net Midwest's coverage of the St. Louis Cardinals. Football Player - Ohio State's First Heisman Trophy Winner, Hall of Famer! One of the more versatile backs seen on any football team, he kicked, passed, blocked, tackled and carried OSU through a perfect season, all of which won him the title of the "Playing Coach." Les hit his peak in his senior year, gaining 924 yards on 163 carries for 5.7 yards per carry. He scored 12 touchdowns in 1944, and completed for touchdowns. He set a new Big Ten Rushing Record and played in all of his team's nine games. As a quarterback Horvath completed 14-of-32 passes for 344 yards passing and six touchdowns. He had 953 yards of total offense and racked up 1,248 all-purpose yards, scored 72 points, and played a total of 402 out of 540 possible minutes. Horvath wound up with 2,055 yards of total offense in his career. Horvath was no slouch in the classroom either, graduating in June 1945 with a degree in dentistry. Les entered the Navy in June 1945 as a double threat: dental officer in the morning and assistant football coach (to Paul Brown) in the afternoon. Horvath continued coaching when he transferred to Hawaii in 1946. He led the U.S. Marines to the service championship in 1946. Horvath played in the NFL with Los Angeles Rams in 1947 and 1948, when he finished third in the NFL in returning punts with 203 yards on 13 runbacks, an average of 15.6 yards. He finished his football playing career in 1949 with the Cleveland Browns. Dr. Horvath established his practice in Los Angeles. His hobby was golf and he coached (very successfully) Bantam Football 1970-72, winning the League Title for Glendale. Les passed away in November of 1995. Hargitay came to the U.S. in the early 1950's and soon entered the "Mr. America" and "Mr. World" competitions. He won the NABBA Mr. Universe title in 1955. Married the bombshell Jane Mansfield (right). Appeared in numerous B films, such as Bloody Pit of Horror and The Loves of Hercules (with Jane Mansfield), and on Television, including Wild Wild West. See this great site for more photos and bio information or see his filmography. Mickey and Jane's daughter, Mariska Hargitay, is star of ER and Law and Order. Soccer Legend: The "Greatest Soccer Player in History!" - part of the the "Magnificent Magyars"
"For Hungary he played 84 times and scored a world record 83 goals! No player, not even Pelé, has scored that many goals for a national team." Puskas began his career with Honved, which in the years following World War Two was the Hungarian army team. Earning an enduring reputation for his deadly left foot, he won an Olympic gold medal with the national side in 1952. Led by Puskas, Hungary recorded one of the most famous victories in soccer history in 1953 when they became the first continental team to beat England at Wembley, winning 6-3 in magnificent style. 6 months later, despite German attempts to injure him in an earlier match, Puskás led Hungary with its incredible 4-year, 33 game winning streak to defeat powerhouse England 7-1 and into the 1954 World Cup finals where favored Hungary lost to Germany after a controversial call taking away a clear Hungarian goal. The "Golden Team" disintegrated after the 1956 uprising against communist rule in Hungary was put down by Soviet troops. Puskas, on tour at the time with Honved, did not return home and instead joined Real Madrid, where he formed his great partnership with Di Stefano. Puskas won three European Cups, six Spanish championships and two Spanish Cups with Real. Puskás later became head coach for team Greece. In July 1999, he was given the honorary title of Hungary's sports ambassador by Prime Minister Viktor Orban, Europe's only premier who is also a registered soccer player. Earlier this year Honved, now Kispest Honved, withdrew the number 10 shirt in honor of Puskas. Hungarian Football Federation decided to rename the biggest stadium in Hungary after the leader of 1950's Mighty Magyars and Legendary striker of Hungary and Spain before an exhibition match between the two countries. Puskás "Öcsi" as known in Hungary, or "Pancho" as known in Spain, is under non-stop hospital treatment, but his doctors let him out to the field to celebrate at the former Népstadion, now known as Puskás-stadion. He was carried round in a cabrio before the game, but unfortunately he has weak condition, so he couldn't start the match by kicking it off. - Read a play-by-play of the 1954 World Cup and the "Magnificent Magyars"
Zoltan played in Super Bowl 46 with the New England Patriots of the National Football League. He was drafted by the Patriots in the fifth round of the 2010 NFL Draft. He played college football at the University of Michigan. A native of Romania (of Hungarian origin), he emigrated with his family to the United States and eventually settled in Ohio. There he was discovered as a potential kicker for his school's football team and became one of the best high school football kickers in the nation, excelling as both a punter and placekicker. After earning top honors in his state, Mesko was recruited by several college football teams. but chose Michigan. His parents Mihaly (Michael) and Erzsebet (Elizabeth) were engineers came to the United States with young Zoltan following the Rumanian Revolution in 1990 where they experienced bullets in their apartment. After a time in New York, they moved to Ohio. Soccer Legend: The "The Man With The Golden Head" - part of the the "Magnificent Magyars"
Top scorer in the 1954 World Cup with 11 goals, Sandor Kocsis was a superb header of the ball and known as "The Man With The Golden Head." In 68 internationals he scored an incredible 75 goals, including a record seven hat-tricks. Born in Budapest in September 1929, he began with KTC before moving to Ferencvaros and at 19 helped them win the 1949 Hungarian title. After Ferencvaros were amalgamated into the new Honved team, he established a great partnership with Ferenc Puskas at both club and international level. Kocsis made his international debut in 1949 and in the early 1950's was the Hungarian league's top scorer three times. A key member of the Hungarian side that remained unbeaten from the start of the decade, he was in the team that beat England 6-3 at Wembley in 1953. He scored two extra-time goals in the 1954 World Cup semifinal against Uruguay, but could not add to his 1952 Olympic Gold medal. In 1956 Honved were playing in Spain during the Hungarian uprising and Kocsis, Puskas and others decided not to return home. Kocsis became player-coach of Young Boys Berne, then joined Barcelona in 1957 and scored in their defeat by Benfica in the 1961 European Cup final. He retired in 1966, at the age of 37, and died in 1978. Described as a born goal scorer whose "job is in the 18-yard box"...Played for FSV (German Second Division) from 1994-95 and was teammates with Wizards midfielder Chris Henderson...In 1995, played for Herfolge F.C. and scored 13 goals in 20 games…Played for Lyngby F.C. in Denmark from 1996-98 and amassed 47 goals in 80 games…Led all scorers with 26 goals in 33 league matches in 1997-98, becoming the first player in 16 years to top the 25-goal plateau in Denmark's First Division...The last two seasons, 1998-99, he was with Sevilla (Spanish Second Division)…In 40 games he scored 20 goals...Also has played for Standard Leige in Belgium, Servette in Switzerland and Saint Etienne in France...Has won the 'Golden Boot' award three times in his career for leading the country's first division in scoring. Molnar signed for Major League Soccer club Kansas City Wizards in January 2000 from Spanish club Sevilla. In the 2000 MLS Cup, he scored the only two goals as the Kansas City Wizards beat the Los Angeles Galaxy in the regulation game and mini-game tiebreaker to advance to the MLS championship game where the Kansas City Wizards put out the Chicago Fire, 1-0, at RFK Stadium, in Washington, D.C. Mikos Molnar scored the only goal. Numerous times Player of the Month. He retired after the championship game. Has 15 career caps and two goals for the Danish National Team...Both of his goals came during 1997 World Cup qualifying matches in "The Park", the national stadium of Denmark...Notched his first goal on September 10, 1997, against Croatia and the second occurred on June 8, 1997, versus Bosnia Herzegovina...Was the third forward on Denmark's 1998 World Cup Team in France...Played the second game versus South Africa, but was ejected early in the second half...Appeared for the Under-21 National Team and tallied 10 goals in 21 contests. Played for Denmark in the 2000 European Championship. Ranks 2nd all-time in minutes played (15,203) and 5th all-time in games played (171). Played in every minute of every game in 1999 and 2000. Owns the MLS record for most consecutive regular season games played (88) and consecutive minutes played (7,956). He attended Delran High School and was named All-American and Player of the Year in New Jersey. He played for Rutgers Uiversity and was named Atlantic 10 Player of the Year. His father, Michael, played professionally in Hungary for Honved in the 1950s...Two older brothers, Michael Jr., and Erwin, both black belts in karate, also played soccer and helped teach Vermes at a young age...Married to Susan, they have a daughter, Nicole (8), and a son, Kyle (7). Became the first American to play in Hungary’s First Division and also in Holland’s First Division...Joined Figueras of the Spanish Second Division in 1991, where he played with former MetroStars teammate Tab Ramos...Played with Raba Eto of the Hungarian First Division in 1989 and with F.C. Volendam of Holland’s First Division in 1990. He was captain of the 1990 World Cup team. His solid play at the MLS level earned Vermes a recall into the U.S. National Team for the final round of World Cup ’98 qualifying, and then into the January training camp to prepare for the World Cup in France … Played 90 minutes as the U.S. closed the qualifying round with a 4-2 win over El Salvador at Foxboro … As of the end of January, his 72 caps tied him for 14th on the U.S. all-time list … At that point, Vermes was also 9th on the all-time goal scoring list with 11, and 9th on the all-time points list with 25. Played for the bronze-medal winning U.S. team at the World Five-a-Side Tournament in Holland in 1989, and was the tournament’s leading scorer with six goals. Also "Miss Oakland," and "Miss California." Representing California, she also won the Miss Photogenic Prize. She was a semi-finalist in the Miss Universe Pageant of 1966 held in Miami Beach, Florida. See thumbnails of all the Miss USA winners here: http://ss1.missuniverse.com/missusa/delegate/pastwinners/past.html. 5-time Olympic Gold Medalist: "Greatest Backstroke Swimmer of All Time," youngest Olympic Champion of all time, and only woman to win five gold medals in individual swimming events! Queen Krisztina...youngest Olympic Champion of all time! Poker World Series Champion of 2002! First Ever to Win 2 Million! This year 13 former WSOP champions were entered in the field, and none made the final table. Englishman Julian Gardner led for most of the tourney. On the final hand Gardner drew the 8 and J of clubs to Varkonyi's Q-10. The flop then came Q-4-4 with two clubs. Gardner went all-in hoping to make his flush. The turn card was another Queen, and the 10 of clubs appeared on the river. For just a moment, Gardner thought he made his flush until the realization hit that it was the TEN of clubs, which gave Varkonyi the full boat and the tournament championship. With the champion pocketing a record 2 million bucks, Gardner had to settle for "only" 1.1 million dollars. Varkonyi's parents are Hungarian and escaped across the border separately in 1956, when the Russians invaded Hungary, bullets flying overhead, and eventually found their way to New York They were lucky to escape, and eventually met each other in New York and married. Varkonyi graduated from MIT with one degree in computer science and another in management and spent 15 years on Wall Street developing systems for trading sales and money management. He married, Olga, from Russia, in April 2001. Joseph Rudy "Bronco" Horvath centered Johnny Bucyk and Vic Stasiuk on the Boston Bruins' famed Uke line, so named for its players' Ukrainian heritage. A misnomer since Horvath was a Hungarian. Horvath had spent time with the New York Rangers and Montreal Canadiens and received the 1954 - 1955 NHL Leading Scorer award, but it was not until he arrived in Boston in 1957 that his career blossomed. The Uke Line combined for 174 points in 1957-58, as Horvath lead the Bruins with 30 goals and 66 points. He added five more goals in 12 playoff games as Boston advanced to the Stanley Cup finals before losing to Montreal. Horvath missed the first 25 games of the 1958-59 season because of a broken jaw, but returned to score 19 goals in just 45 games. Horvath was at his best in 1959-60 when he enjoyed a 22-game point scoring streak and battled Bobby Hull all season long for the NHL lead in goals and points. He tied "the Golden Jet" with 39 goals, but lost the Art Ross Trophy by a single point as he collected 41 assists to Hull's 42. Horvath was named to the NHL Second All-Star team behind Jean Beliveau at centre that year. After one more season with the Bruins, Horvath moved on to the Chicago Black Hawks in 1961-62 and split the following year between the New York Rangers and Toronto Maple Leafs. He retired in 1970 and became a scout and later opened a cleaning business. - The Sporting News article, "Where have all the great lines gone?" A close friend of Béla Károlyi, he defected with Béla and Márta from the Rumanian Program in 1981. He was the choreographer for Nadia Comaneci, Kim Zmeskal, Betty Okino, Michelle Campi, Dominique Moceanu, and Kerri Strug, to name a few. Geza was an Olympic coach from, 1988-1992. Instrumental in developing a new USA Gymnastics Women's Team for Sydney 2000 and Athens 2004. Read about his defection at Tulsa Gymnastics. Special thanks to USA Gymnastics for the information above! Baseball Superstar: World-Series Slugger, Hall of Famer, "The Muscular Magyar"
Prof. Tom Barthel wrote: Joe spent his years with the St. Louis Cardinals, Brooklyn Dodgers, New York Giants and Boston Braves. His lifetime batting average was .324. He played in the Major leagues from 1932-1948. He was often called the "muscular Magyar." He won the Triple Crown in 1937, but was beaned in 1940 curtailing his effectiveness. But what a hitter he was before that beaning. In 1936 he won his first RBI title with 138, and among his league-leading 223 hits were 64 doubles, an NL record that still stands. In his 1937 Triple Crown season he set career highs in batting average, with .374, and in slugging, at .641, and he had 237 hits, 31 homers, and 154 RBI. Medwick led the National League in RBI for three straight seasons. In 1937, in the middle of that streak, he won the Triple Crown and the Most Valuable Player Award, but he also led the league in hits, runs, doubles, slugging, and fielding average. Medwick was born to Hungarian immigrant parents and grew up in New Jersey. During high school he starred in baseball, basketball, and football and was flooded with offers of football scholarships, including one from Notre Dame. Chess Grand Masters and Olympic Gold Medalists! - Judith has been called the Greatest Female Player of all Time! became a grandmaster at the tender age of 15, beating Bobby's Fischer record. Since then she has rapidly ascended the totem pole of chess fame, jumping from 30th to 10th in the World Chess Federation list of the top ranked players in only a few years and is poised to take the world championship. She overtook her sister and became the highest rated female chess player in the world. At 22 she became the first female player to win the U.S. Open Chess Championship in 1988. She beat Anatoly Karpov 5-3 in a speed chess tournament to become the first woman in history to defeat a sitting world champion! In 1980 and 1982, Szabo became the first gymnast to win two Junior European AA gold titles. After her multiple gold medals in Los Angeles (team, vault, balance beam, and floor exercise, and all-around respectively), Szabo and her teammates on the glorious Rumanian women's team enjoyed a crushing defeat against the Soviets, winning the gold medal in the team event at the 1987 World Championships. She retired shortly thereafter. Szabo was recently inducted into the International Gymnastics Hall of Fame. Imre was one of Romania's top players in the 1960s. He even played abroad in Turkey in Kayserispor for two years, a rarity under the communist regime. He played 12 times for Romania. He began his coaching career at Steaua, Bucharest in 1975 and remained with the team with some breaks until the 1980s. In 1986, he was the coach of Steaua which won the European Champions' Cup. He coached Romania from 1986 to 1990 and also trained Hungary, the Hungarian team Videoton and Greek team Panionois. Ienei has moved "upstairs," becoming a technical adviser entrusted with overseeing developments at Rumanian youth, U-21 and senior levels, making room for his replacement, Laszlo Boloni, the new Rumanian head coach, and yes, another Hungarian. Ienei, is known for his good results and polite manner. He is an ethnic Hungarian and speaks Rumanian with a regional, Transylvanian accent. (WBF) World Heavyweight Boxing Champion, Australian Heavyweight Champion - Fought Muhammad Ali for the world title twice! Bugner was born in Hungary but launched his pro career in London in 1967. Fought out of England until his retirement from boxing. Defeated Henry Cooper in 1971 to win British, Commonwealth and European heavyweight titles. He beat notable American heavyweights such as Chuck Wepner, Mac Foster and Jimmy Ellis. At 6-5, he was more boxer than puncher. In 1973, he lost consecutive 12-round fights to Muhammad Ali and Joe Frazier. Bugner challenged Ali for the world heavyweight title again on July 1, 1975 in Kuala Lampur and lost a 15-round decision. Bugner made a comeback to boxing and in 1998, at the age of 48, he defeated former WBA champ "Bonecrusher" Smith, who was 45. Zsolt Erdei was phenom from the start. Erdei was twice Hungarian Youth Champion, twice Hungarian and European Junior Champion, 6-time Hungarian National Champion, twice European Champion (1998 and 2000) and Sydney 2000 Olympic Bronze Medalist. He turned pro for Hamburg’s Universum Box-Promotion and has taken the professional boxing world by storm. He won the WBO Intercontinental title in 2002 and 2003 and then shocked the much favored champion Julio Cesar Gonzalez to take the WBO World Title title in a 12-round unanimous decision in Germany on January 17th 2004, just three months after Gonzalez defeated former light heavyweight king Dariusz Michalczewski to capture the WBO title himself. Though he has a history of only 19 fights, he is undefeated with a record of 19-0 with 13 KO's and according to American box rankings is already ranked 3rd in the world. This is the first time a Hungarian has achieved such a high ranking since the legendary Laszlo Papp. Known for his elegance and dominating ball handling, Florian played for the Budapest-based Ferenc Varos in the Hungarian professional league from 1952 - 1974 and was part of the national championship team in 63, 64, 67, and 68. He won Bronze in the 1960 Olympics and participated in the 1962 and 1966 World Cups in which he won the Scoring Title! The only Hungarian to be named "Footballer of the Year" or "Gold Ball" in 1967. Former Rumanian international midfielder and most capped player after Hagi, he was appointed coach of the Rumanian replacing Emeric (Imre) Ienei (another ethnic Hungarian), who has moved "upstairs," becoming a technical adviser entrusted with overseeing developments at youth, U-21 and senior level. As a player, Boloni scored 28 goals and won 108 caps for Romania. He was also a member of the Steaua Bucharest side which won the 1986 European Cup. After spells playing in Belgium and France, he began coaching French club Nancy. In 2001, Boloni left the Rumanian helm and signed an agreement in Paris to coach Sporting Lisbon. NFL Football Player - Cincinnati Bengals #66 - All Conference Honors every year since a Sophomore at Montana! Szalay played his college career for the Montana Grizzlies and was picked up for the 2002 season by the Cincinnati Bengals as a Left Offensive Guard. At Montana, he was a three-year starter that won All-Conference honors every season since he was a sophomore. A tough, dominant lineman best blocking for the run. Quick off the snap into his blocks, shows pop at the point of attack and good straight ahead blocking power. Works his hands, stays square and strong in his upper body. Fights hard throughout the play and a nasty lineman that looks to take out opponents. Quick mentally picking up his assignments but a limited athlete that has difficulty physically getting to the spot or handling opponents not immediately in front of him. Lacks body adjustment and does not move well in space. Not a natural knee bender, blocks tall and limited to very confined quarters. His power and tenacity give him consideration as a back- up for a team that employs a zone blocking scheme or does not ask its lineman to cover any degree of area. A huge presence at over 300 pounds and 6'4", he was fined by the Bengals at their 2002 training camp for "throwing people around." Orosz played his collegiate career for the Ohio State Buckeyes (where he is forth on the all-time punt yardage and an All Big-10 Pick in 1978) and was drafted by the Dolphins in 1981. Orosz played for the great Dolphins Superbowl 17 team. He was traded to San Francisco in 1983 and played there in the following season as well. Legendary Table Tennis World Champion - "The Greatest Table Tennis Player that ever Lived"
Born Viktor Gyözö Braun, Barna won 32 World Championship medals: 23 gold, six silver, and three bronze. His championship victories include five Singles events, eight Doubles, three Mixed-Doubles, and seven Team titles. He won the Hungarian National Title 17 times. He is described by Sir Ivor Montagu, President of the International Table Tennis Federation (1926-1967), as "the greatest table tennis player who ever lived". Barna won his first World Singles title in 1930 and his last (of five) in 1935. His only loss within six years was to countryman Miklos Szabados--his regular Doubles partner--in 1931. In 1929, Barna and his Hungarian National Team won the Swaythling Cup (men's World Team Table Tennis Championship). He would be a member of six consecutive Swaythling Cup championship teams (1929-1935), as well as the Swaythling Cup victor in 1938. Barna's greatest performance came in February, 1935 at the World Championships in Wembley, England, when he captured the World Singles, Doubles (with Szabados) , and Mixed-Doubles (with Anna Sipos) crowns. In May, 1935, Barna's Singles career ended when his right (playing) arm was severely injured in an auto accident. He nonetheless won (with England's Richard Bergmann) the World Doubles title in 1939. All, but two, of Barna's Doubles crowns (1929-1935, 1939) were won with Miklos Szabados as his playing partner--exceptions: Sandor Glancz in 1933, and Bergmann in 1939. He was founding President of the Swaythling Club International and is now President in Memorium. The first world championship tournament was held in London in 1927. From then until World War II, Hungary dominated the sport. The top players of that early period were Barna and fellow Hungarian Maria Mednyanszky, who won seven women's world championships. Boxer - WBF Super Welterweight Champion and world-title contender - "The Ace of Tokai"
After competitive weightlifting, Kótai Mihály started his boxing career at 13 to become Hungarian Champion at 16 and soon thereafter European Champion with his knockout power. He went professional in 2000. He became known as a the "King of the KO" when, in his first 9 winning fights, he scored KO's in 6 - all in the first round. He won 24 straight fights until a surprise loss in September 2003 which led to a shakeup in his management and training team. In the following fight, he again stopped his opponent in the first round. FIRST official women's world champion at table-tennis which she won five times in succession and won a further 18 world records. She went on to win a total of 7 World Championships. For this she was awarded the Golden Order of the Hungarian People's Republic, her country's highest sporting honor. Mednyanszky almost lost her final without actually having the opportunity to play. Mednyanszky, she was not informed of the time of her match in the singles final against Spiring. So she went with a friend, Hungarian newspaperman who lived in London, to a soccer game. They were late for the beginning of the table tennis match and managed with difficulties to get the organizer’s permission to play the match later on in order to avoid the penalties for the Hungarian Federation. Mednyanszky took a deep breath and beat all opponents one after another! Szabados was one of the top two most successful table tennis players of his time (the other, Viktor Barna), winning 15 World Championship titles, including the World Singles crown in 1931 (defeating Barna). From 1928 to 1935, Szabados won six World Doubles titles (1929-32, 1933-35, with Barna) and three Mixed Doubles (1930, 1931, 1934, with M. Mednyanszky). He was a member of the Hungarian World Championship (Swaythling Cup) Team five times --1929-1931, 1934-1935). In l931, Szabados won all four World events--men's Singles, Doubles, Mixed Doubles, and the Swaythling Cup. In 1937, Szabados and countryman Istvan Kelen embarked on an exhibition tour of the Far East and South America, eventually settling in Australia. There he won numerous national titles while devoting himself to the development of table tennis. Table Tennis Legend - first female player to use the "pen holder grip." Anna Sipos won 21 medals in World Championship table tennis competition, including eleven gold medals. She is ranked the second best women's player of her era. Among Sipos' titles: the World Singles championship in consecutive years, 1932 and 1933; the World Doubles championship six consecutive years (with M. Mednyanszky), 1929-1934; and the World Mixed Doubles three times--with Istvan Kelen in 1929, and Victor Barna in 1932 and 1935. Sipos was the first female player to use the penholder grip, but changed to the shakehand grip in 1932. After changing her grip, she was able to defeat her old nemesis (and doubles partner) the greatest female table tennis player, Mednyanszky. Hockey Phenom - Top Scorer for the NY Islanders and LA Kings - sixth in the NHL in scoring! Pálffy was drafted 26th overall by the New York Islanders in the 1991. He made his NHL debut with five games in 1993-94. In the shortened 1994-95 season, Žigmund scored his first ten NHL goals in 33 games. In 1995-96, Žigmund emerged to lead the Islanders in goals (43), points (87), power-play goals (17), game-winning goals leader (6) and shots (257). He was a two-time NHL Player of the Week winner that year. In 1996-97, Žigmund led the Islanders with 48 goals, 42 assists and 90 points. In 1997-98, Žigmund played in his first mid-season All-Star Game and scored a team-best 45 goals, 42 assists and 87 points. In 1998-99, Žigmund scored 22 goals in just 50 games for the Islanders. At season's end, he ranked 22nd on The Hockey News' Top-50 NHL Players list. On June 20, 1999, Žigmund was traded to the Los Angeles Kings. In his first season with Los Angeles, Žigmund scored 27 goals and 39 assists in just 64 games. At season's end, he ranked on The Hockey News' Top-50 NHL Player list for the third consecutive season. In 2000-01, Žigmund led the Kings with 38 goals, 51 assists (tie), 89 points, four short-handed goals, eight game-winning goals and a 17.5 shooting percentage. He also led the team with a +22 plus/minus rating and led all forwards with 19:30 minutes of ice time per game. He also played in the mid-season All-Star Game. His compensation in the 2002/2003 season: $7,000,000.00! Swedish-trained, Hungarian winger Vas was drafted in the 2nd round (#32 overall) by the Dallas Stars and has all the tools to become a very successful player in the future. His game relies a lot on speed. He can put up the most spectacular moves at times and has indeed a great hockey sense. Vas is just as good at scoring as he is at delivering the puck. His physical game is also impressive. Vas was ranked 55th among European forwards and defensemen by Central Scouting for the 2002 NHL Entry Draft. The Red Line Report ranked him 149th overall. Vas had 13 goals and 17 assists and a plus-16 rating in 33 games in Sweden's junior league in 2001-02. Bellak and boyhood friend Table Tennis Legend, Victor Barna, began playing table tennis at Bellak's house after his father gave him a set for his 13th birthday. The acrobatic Bellak won seven World Championships, including six Swaythling Cups (men's World Championships, with the Hungarian National Team) between 1928-1938. The Swaythling victories came in 1928, 1930, 1931, 1934, 1935 and 1938. He also won mixed doubles with Wendy Woodhead at the 1938 world championships. In the mid-1930s, Bellak, his friend Sandor Glancz, and others toured the United States and played in over 40 cities. Bellak then captured the U.S. Open men's singles championship in 1937 and 1938. Known as "The Clown Prince of Table Tennis," many thought Bellak's clowning antics prevented him from even greater competitive success giving him the moniker, "the greatest player never to win a world singles title." Interestingly, many of his silver-place showings came at the hands of the great Victor Barna! Born in France in 1928 but raised in Hungary, GM Pal Benko learned chess from his father at age 12. He lacked serious competition until age 17, when he became a master in one of his first tournaments. By age 20, he was Hungarian champion; but at age 23, he was a Russian concentration camp inmate because he had been caught trying to escape to the West. To complicate his life further, the Secret Police once suspected he was a spy until he convinced them, with some difficulty, that the code on his correspondence was only chess notation. Finally, he gained his freedom, through political asylum, and became a U.S. citizen. He compiled an outstanding record in chess olympiads as a player and as a team captain. Twice a Candidate for the World Championship, Benko also won or tied for first place in eight U.S. Open tournaments -- a record. His exploits in this country in the 1960's led to him being called the "King of the Swisses." These genres are considered so different that it is as rare to find someone who can do both well as it is to find someone who is both a good novelist and a top class biologist. Benko has taught thousands of players both in person and through his columns. His Chess Life column "Endgame lab" is one of the most popular columns in the magazine and in the world, and the Benko Gambit is one of the few distinct opening systems to be named after a modern player. One of Benko's most valuable gifts to American chess is nearly forgotten today. At the request of Ed Edmondson in 1970, Benko agreed to give up the slot he had earned in the Interzonal tournament to free up a place for Bobby Fischer. This generous act gave Fischer the chance he needed to advance to the world championship, a chance he made the most of. Mark's grandparent left Hungary for the United States after WWI. NEED MORE INFO! expressed by its individual members and member organizations.